In contrast to Sweden, which one often hears about, in particular through its many gaming developers, Denmark is quite discreet in the European casino games sector. However, the country has quite a developed local industry with more and more online casinos and especially 6 important land based casinos that are well known beyond the Danish borders. It’s one of these that Live Dealers Casino wishes to present to you in this review. Also known as the Royal Scandinavian Casino, the Royal Casino is in the town of Aarhus , the second largest city in Denmark. In the East of the country, it is a seaside resort that has thousands of visitors every year who come to enjoy its beaches and to discover its many historic and cultural attractions. 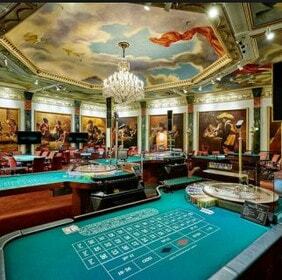 In these wonderful surroundings the Royal Casino was built and opened in 1838. Built in the Renaissance style, the building has a hotel-casino that has welcomed Danish and European aristocracy since it opened. Over the past few decades, several members of the Danish royal family have stayed there. Now, the complex has 106 sumptuously decorated rooms with all the amenities needed for a comfortable stay. Spread over 8000 square metres, the Royal Casino’s gaming area offers players quite a complete range of games. Among these are 80 slot machines which are suitable for all types of slots fans. Along side these are twenty electronic roulette machines recently installed to meet the needs of a younger more family orientated clientele. For table games fans, the casino offers 8 tables at which one can play Blackjack and Roulette. A Poker Room is also open every evening and during tournaments. Thanks to a recently signed partnership with the developer, Authentic Gaming, players from all over the world can now join in games every evening at one of the Royal Casino Aarhus’ Roulette tables. Called Authentic Roulette Royal Casino, this new table offers an ultra immersive gaming experience thnks to 5 different cameras that stream the action live with 4K images. Available on PC and mobile devices, the table is open every evening from 7PM. It remains open until 2 AM on Sundays and Mondays, until 3am on Tuesdays, Wednesdays and Thursdays and until 4am on Fridays and Saturdays. For those who dream of discovering the sumptuous Danish casino and experiencing its exceptional atmosphere, you only have to connect to Dublinbet, Casino Extra and Lucky31 Casino. All Authentic Gaming partners, each of these virtual casinos provides access to this gaming table which guarantees a really unique gaming experience.